Digital Office Solutions have specialised in printer repair for over 10 years. Our technicians cover Crawley, Sussex and Surrey, West Sussex & Surrey and our work is guaranteed, whether we look after one printer for you or fifty. Service & Repairs to:- Hewlett Packard, Canon, Epson, QMS, Minolta, Kyocera, OKI, Lexmark, Brother, Tektronix, Xerox, Sharp, Samsung, Ricoh, & Panasonic. If you have a faulty, broken laser printer or commercial inkjet printer with a problem in Crawley, Horley or Gatwick we will undertake a workshop laser printer, commercial inkjet printer repair on clients equipment in our Bonnett's Lane, Crawley based workshop. If you have a faulty, broken laser printer or commercial inkjet printer with a problem in Crawley, Horley or Gatwick you can request a service call, visit from our mobile printer service engineer, who will attend your site and undertake a repair or advise you on whether a repair would be economically viable. We also have £50,000 pounds worth of printer consumables available at our Crawley warehouse, if you need a consumable or spare part we may have it in stock if not we will be able to source the part within 24 hours if available. 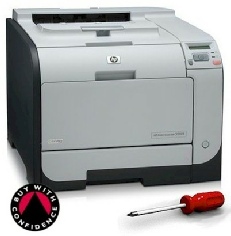 We also supply new and refurbished laser printers if you require a replacement printer. Modern multi-function printers can be difficult to install, if you require help installing a laser printer or commercial inkjet printer. We can install wifi printers. Bought a new PC or Laptop and need help setting up your printer we can help, our mobile engineer will attend your Crawley, Horley or Gatwick office or home and install the printer. A lot of new printers can be connected using a Ethernet / network connection, connecting your laser printer or commercial network printer via a Ethernet connection will facilitate faster printing and scanning speeds over USB or wifi connections, if you need help connecting your network laser printer in Crawley, Horley or Gatwick then we can help. Our mobile printer technicians' can help connecting a printer to a Windows Server, or Windows XP, Windows 7 and Windows 8 via a network connection. If you have a faulty, broken plotter or wide format printer with a problem in Crawley, Horley or Gatwick you can request a service call, visit from our mobile wide format, plotter service engineer, who will attend your site and undertake a repair or advise you on whether a repair would be economically viable. We also have £50,000 pounds worth of printer consumables available at our Crawley warehouse, if you need a consumable or spare part we may have it in stock if not we will be able to source the part within 24 hours if available. We also supply new and refurbished laser if you require a replacement printer. If you have a faulty, broken plotter or wide format printer with a problem in Crawley, Horley or Gatwick you can request a service call, visit from our mobile wide format, plotter service engineer, who will attend your site and undertake a repair or advise you on whether a repair would be economically viable. We also have £50,000 pounds worth of printer consumables available at our Crawley warehouse, if you need a consumable or spare part we may have it in stock if not we will be able to source the part within 24 hours if available. We also supply new and refurbished printers if you require a replacement printer.